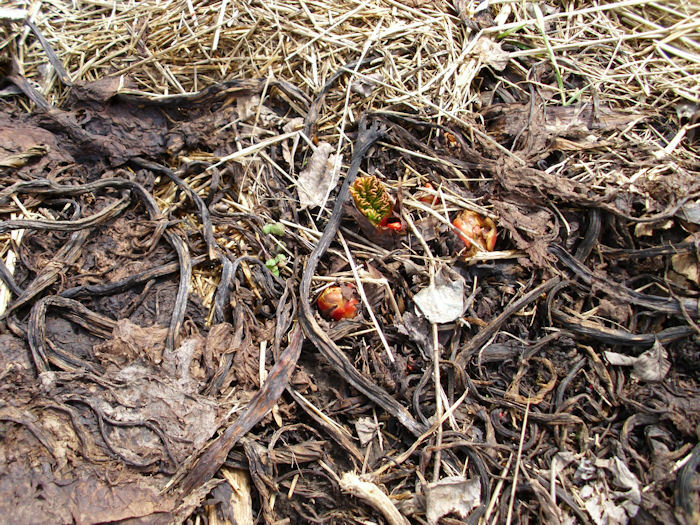 Of course, it’ll be a while before I’ll enjoy any fresh rhubarb. I’ll show you how it looks later. One of the ways I like it best is freshly picked with just a tad of sugar. It’s also good in rhubarb rolls and we make wine from it (among other things). Each one of those tiny little heads will become another onion. We should have quite a wealth of them this year. The Egyptian walking onion is our second taste treat from the garden. The first taste treat is horse radish. The horseradish isn’t quite up yet; at least, it isn’t far enough up to tell what it is. 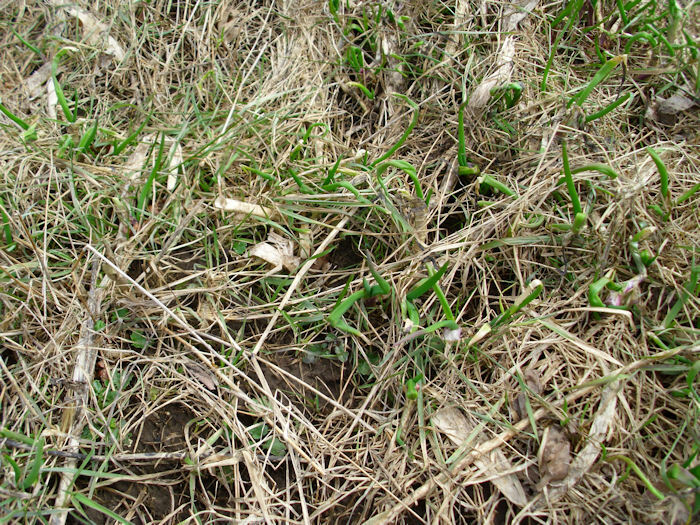 Normally, you’d dig it up this time of year though, grind it up, add some vinegar, and enjoy. Another spring delight is asparagus. I’ll be sure to upload some pictures of it when it comes up. 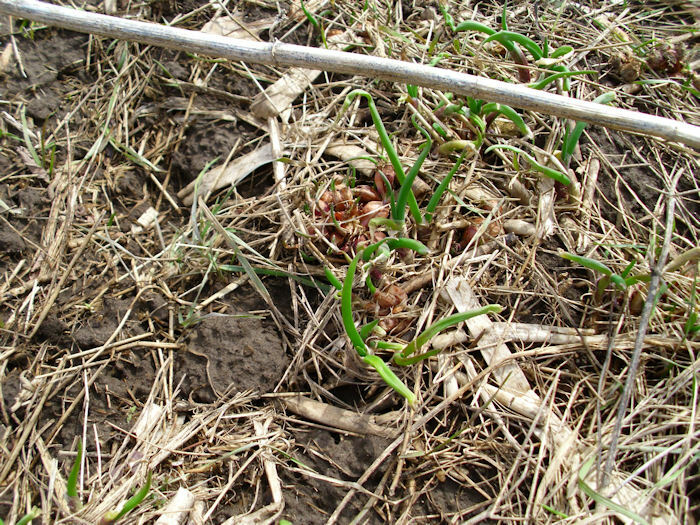 Asparagus is planted very deep and doesn’t make an appearance yet for at least another two weeks (probably longer). Part of the springtime ritual is pruning the trees. We have 32 trees in our orchard. This last Saturday we pruned the apples. Each tree has a unique pruning strategy and you’ll find that pruning strategies differ between gardeners. 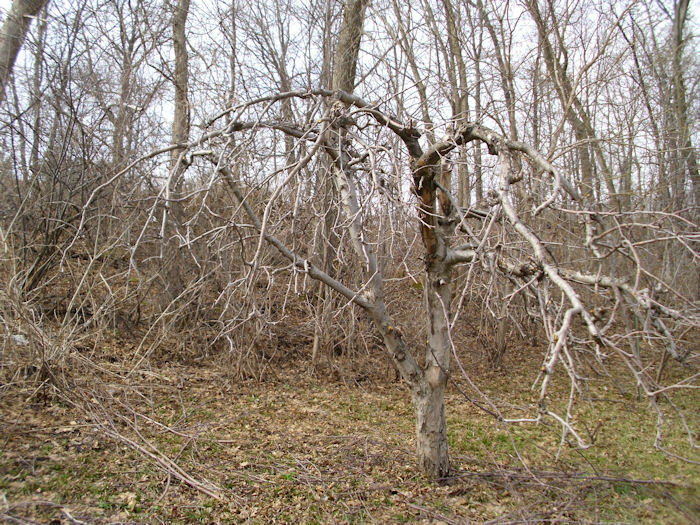 Here’s a typical apple tree after pruning. See how the apple looks sort of like an umbrella or perhaps a gnarled old man? The approach we use works well for hand picking. It’s an older technique that many modern orchards have replaced with a technique better designed for picking apples from a truck. We prune our apples every other year; the off year. Apples produce well one year and then take a bit of a vacation the next year. Yes, we’ll get some apples from our trees, but not as many as on a good year. Of course, prudent canning techniques ensures everything evens out. What sorts of spring delights do you experience? Let me know at John@JohnMuellerBooks.com.